Marriage Counseling Chicago: Pre-Wedding Jitters or Cold Feet? 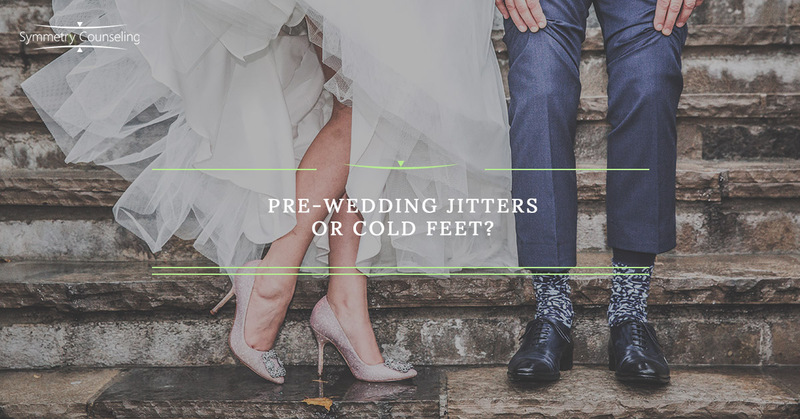 Pre-Wedding Jitters or Cold Feet? As your wedding is quickly approaching, you may begin to experience an unsettling and nervous feeling as you realize you are about to commit yourself to your partner for life. You may have thoughts such as, “What am I getting myself into?”, “What if this doesn’t work out for us?”, or even ask yourself “Am I settling?” If you are feeling uneasy or are having these thoughts, you are not alone as it is very common! Typically, this period of anxiety just means you have a case of the pre-wedding jitters typically caused by stress. However, sometimes, it can be more serious. Symptoms of cold feet include panic attacks, feelings of entrapment, the instinct to run, or even wanting to call off the wedding. Below is a more in-depth description of the pre-wedding jitters and cold feet to help you decipher if you are ready to make the commitment or if you may need some time to work on the relationship first. Pre-wedding stress can make you more irritable, intolerant, and easily annoyed; consequently, you may be hyperaware of your partner’s flaws and annoyances. If out of the blue, your partner’s habits begin to bother you, take a deep breath and remind yourself this is a stressful time for both you and your partner. Do your best to keep things in perspective, relax, and remind yourself why you are in love with your partner. It may be helpful to use self-care techniques such as reading, drawing, or journaling to relax and take your mind off the wedding itself. And don’t overlook the importance of 7-9 hours of sleep per night for optimal functioning. It may also be helpful to sit down and make a list of 5 things you love about your fiancé and share them with him or her to keep communication open. Typically, these jitters will lessen and the second-guessing goes away as the stress is alleviated. Many couples turn to premarital counselors during this time to help with communication or just to help get to know each other better. There are some engagement relationships, however, in which partners experience feelings that are beyond the pre-wedding jitters and stress. If you or your partner are experiencing chronic panic attacks, significant or excessive crying, dreading the wedding, feeling nervous about the relationship itself, or don’t want to see the other partner, there might be a more serious issue. If you are feeling this way, you should see a counselor or seek another type of support (family or friends) to address why you are so distraught. There are many reasons to fear the failure of a relationship, but it is important to confront these issues or differences immediately. Don’t be afraid to postpone or call off the wedding while some of the issues and disagreements are addressed. Don’t be discouraged; it is absolutely possible to get through cold feet and have a successful relationship and marriage! If you or your partner is currently experiencing pre-wedding jitters or cold feet and would like some support, it may be useful to connect with a therapist. Contact Symmetry Counseling to set up an appointment with one of our highly skilled clinicians at one of our two Chicago locations.